In the '30s and '40s, traveling minstrel guitarist brought news, comedy, and drama to scattered American towns. 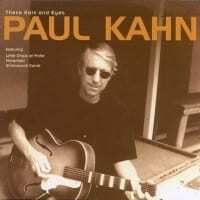 Kahn tells stories like Dave Van Ronk and shares satire like Patrick Sky. Paul Kahn could have walked off a traveling medicine show and into a modern studio. Actually, instead of selling snake oil, this former string bassist for Béla Fleck's Tasty Licks has been running Concerted Efforts. There he books and manages roots artists -- also, as Paul Bernard, writing songs for C.J. Chenier and Eddy Clearwater. These Ears and Eyes is all-original material in the finest Americana traditions of country-blues, ragtime, and folk. "The Wayward Daughter" tells the personal side of a courtroom drama better than a newspaper ever could. "Marmalade" is a fun praise of a favored condiment. "Lovin' You Way Too Much" is in a Southern style and is a poignant telling of love lost -- the root of the best ballads.